An unsolved shooting and an unexplained fire combine to unsettle and change several lives forever -- and provide an insider's glimpse of off-season life on Martha's Vineyard. Jay Segredo has a secret. Now three years after he returned home to Martha's Vineyard his secret is under siege. His sister is pressuring him to marry his now-widowed childhood sweetheart. His boss, jealous of his popularity, wants him gone. And his barely sober ex-brother-in-law blames Jay for the breakup of his marriage and is (literally) gunning for revenge. Jay's friend Shannon Merrick, a lesbian who volunteers as an advocate for women and children in crisis, sees disaster in the making but hasn't been able to convince Jay that closets aren't safe places to hide. Shannon, however, has her own secret: a talented painter, she locked the door to her studio years before and hasn't opened it since. Or buy it via this website. Susanna has set herself up with PayPal, so you can order direct and get a personally inscribed copy. Use the contact form to make a deal. Like Ireland in the past two hundred years and Concord in the mid-19th century the Vineyard is known for incubating writers. Some of them set their stories right here on the Island. 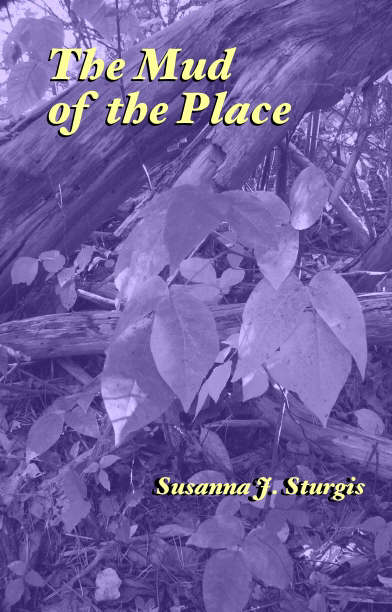 The most illuminating to come down the pike in a long time -- perhaps the most illuminating ever -- is The Mud of the Place, by Susanna J. Sturgis, published by Speed-of-C Productions, $19.99. Imagine making friends with five of the smartest, funniest, most ruggedly individualist people on the Vineyard, then following them through a chain of startling events -- part mystery, part life drama -- all the while touring the nooks and crannies of this rock and seeing it anew through Ms. Sturgis's discerning eye. . . . This wealth of characters and venues is a page-turner. I spent an entire Sunday unable to leave the couch as I pored through this book, and yet the irony was that I had no sense of missing a single moment outside my windows, out there on the Island, because Ms. Sturgis introduced me to more facets of Vineyard living than I've come across in my own 18 years of residing here year-round. . . .
From the first gunshot on the West Tisbury–Edgartown Road to the very satisfying ending, Ms. Sturgis draws the reader in with expertly turned phrases and a keen knowledge of Vineyard byways. Her well-developed characters reside on the beloved (but oft-misunderstood) island where the alluring beauty belies the reality beneath—one where too frequently "ambition is useless and apathy a virtue." Ms. Sturgis’s seamless transitions keep the reader poised on every page waiting for the twists and turns surely to come—along casual dirt roads or by the shore. Her astute observations lay bare the workings of the five-corners-miasma of island life. A must-read that will leave the reader begging for a sequel—and soon! The pacing is perfect, the multiple viewpoints well handled and well distributed, a complicated storyline made easy to follow, and the characters engaging. . . . Really wonderful work! A solid, clever, compelling immersion in the realities of life on a famous, glamorized place, from the working-class level all the way up to island aristocracy. The story is made of real-life challenges, dangers, ethical dilemmas, and warm, true human bonds that kept me reading eagerly even without a murder or a monster to keep me engaged. That's because the writing is excellent — lean, sharply observant, and downright witty. What a good, satisfying novel! A sensitive, witty, and tightly plotted portrayal of life on Martha's Vineyard that only a true Islander could have written. Nice going, Susanna! The Mud of the Place does such a beautiful job of capturing the quality of interactions among people in the small Cape and Islands towns and the culture and environment of the place. It's all the more precious because the communities and their fragile environment are changing so much. And what memorable characters! As a gay man, Jay faces the challenges of being different in his own hometown, and the fear that coming out will mean losing the family, friends, and job that he loves. He might not have to be so frightened these days. I thoroughly enjoyed this novel! The characters of The Mud of the Place ring true and all the island references have such authenticity. Sturgis speaks with a great awareness of the many and varied aspects of life on Martha's Vineyard. And Pixel adds a warm touch for those of us whose dogs often accompany us on our errands. I feel like I know these people and--who knows?--maybe I do! A Massachusetts native Susanna started writing for publication in the late 1970s, while living in Washington, D.C. Her essays, reviews, and poems have appeared in a variety of feminist, lesbian, and gay publications. In 1985 she moved to Martha's Vineyard. Within a couple of years she'd become involved in the local theater scene and gone to work as first typesetter, then proofreader, and eventually features editor for the Martha's Vineyard Times. Between 1989 and 1991 she edited three original anthologies of women's fantasy and science fiction: Memories and Visions, The Women Who Walk Through Fire, and Tales of Magic Realism by Women (Dreams in a Minor Key). It took a while for all this to compost, but compost it did: one result was The Mud of the Place. Although she's been swearing for years that she's going to leave any day now, she still lives on Martha's Vineyard, where she's frequently seen in the company of her Alaskan malamute dog, Travvy. She supports herself as a freelance editor and is working on her second novel, working title: Wolfie, in which a mismanaged malamute and an 11-year-old girl challenge Shannon of The Mud of the Place to both open her home and revisit her own past. 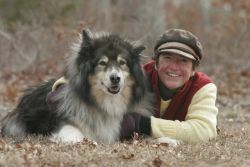 For more about Susanna, not to mention photos of Travvy and the late great Rhodry Malamutt, check out her virtual home. Martha's Vineyard does exist. For some people it's here year-round; for others it winks into existence around Memorial Day and disappears by mid-October. You won't meet any Mud of the Place characters on that Martha's Vineyard and none of the novel's events ever happened there. But if those characters managed to make it to the real Martha's Vineyard they'd almost certainly recognize the place. Betty Ann Lima Bryant (1938-1994) to whom The Mud of the Place is dedicated, was an islander born and bred. "Community activist" doesn't do her justice. Neither does "one-woman social services agency." But she was both. Her favorite reporter, the late Gerry Kelly, wrote in her Martha's Vineyard Times obituary: "She was sharp-tongued, witty, passionate, and dramatic. She was never without an urgent cause or a desperate need, always on behalf of someone else." Another friend, former Massachusetts governor Michael Dukakis, called her "the kind of person who makes democracy work in this country." Both Shannon Merrick and Jay Segredo have tried to live up to her example. "If your feet aren't in the mud of a place you'd better watch where your mouth is." Don't look through Grace Paley's best-known stories, poems, or other writings for these words. They appeared in the May 16, 1994, issue of The New Yorker, in a short piece publicizing an upcoming reading. Paley was asked if she would write about the situation in South Africa. She might have a character comment on it, she said, but "if your feet aren't in the mud of a place, you'd better watch where your mouth is." Most people who write about Martha's Vineyard get it, at best, incomplete, and at worst totally wrong. Grace Paley nailed the reason why -- and at the same time, in a most Paleyesque way, issued a challenge: Where were my feet? If not me, who? Paley's words became my touchstone: Even if your feet are in the mud of a place, you'd better watch where your mouth is. Grace Paley died on August 22, 2007, after a hard battle with cancer and a long, inspiring life of writing and activism. Linthicum Maryland, is a long way from Martha's Vineyard. Speed-of-C Productions is mostly known as a publisher of science fiction. How did Speed-of-C and The Mud of the Place get together? Thereby hangs a tale! Buy Don and Susanna a couple of beers and ideally dinner and they'll tell you the whole story. Over dessert they will explain what "metagay" means and how The Mud of the Place is really a science fiction novel in drag. Meanwhile, check out the Speed-of-C website and don't miss Dance for the Ivory Madonna, which is one of Susanna's favorite novels.